"An artist works with all his senses. It might not seem that painting has anything to do with the sense of smell, but in the case of Lilac Cottage, it does.The 4th issue in the Flower Cottages of Carmel collection is inspired by a real cottage I discovered amidst an overgrown garden in Carmel, but more than that, it is my attempt to evoke the heady perfume of lilacs." Purchase unframed and save $125.00. Lilac Cottage copyright © 2002 by Thomas Kinkade is prohibited from being copied. 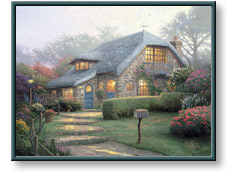 All applicable copyright © laws apply and are reserved by artist Thomas Kinkade.